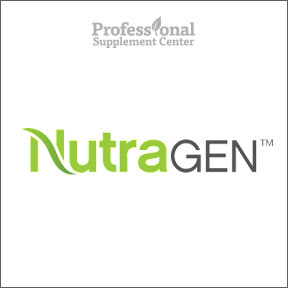 Professional Supplement Center is pleased to announce the addition of NutraGen™, a line of organic, whole food, eco-friendly products manufactured in the U.S.A. In keeping with their commitment to optimal wellness, healthy aging and a healthier planet, only carefully selected synergistic, scientifically proven raw materials are utilized to formulate products of uncompromised quality and purity. All products are researched, designed and formulated by doctors and certified clinical nutritionists and have been clinically researched, tested and published in well respected medical journals. Every aspect of production from formulation to finished products is closely monitored in their certified organic facility in accordance with good manufacturing practices. All products are gluten, soy, dairy and egg free and are formulated with Non-GMO, organic vegan ingredients. These eco-friendly packaged formulas are available solely through healthcare professionals. Pure Plant Protein™ – This creamy, vanilla flavored, premium plant protein mix is formulated with a blend of organic plant proteins, including pea, brown rice, flax and quinoa, plus additional plant enzymes and whole fruits in support of overall wellness. The formula is designed to strengthen the immune and digestive systems, reduce inflammation, increase lean muscle mass, aid muscle recovery and support glucose control and weight management. This low carb, low sugar formula provides 21 g of exceptional quality protein per serving. Pure Greens™ Organic Superfood – Formulated with pure, certified organic ingredients, this great tasting greens powder is expertly crafted with a perfect balance of green grasses, vegetables, fruits, herbs and plant foods and provides vitamins, minerals, antioxidants, enzymes, fiber and probiotics. Pure Greens™ is formulated to support whole body wellness and healthy aging and for cardiovascular, immune, digestive, glucose and liver support. Available in Fresh Mint and Crispy Apple flavors. Pure Digestion Plus™ – This organic, unflavored digestive and fiber powder is scientifically formulated with a broad spectrum of soluble and insoluble fibers, digestive enzymes and probiotics in support of healthy digestion, normal blood glucose levels and bowel regularity. This formula helps to reduce abdominal discomfort including pain, cramping and bloating. Pure Ωomega Plus™ – This formula combines the benefits of omega-3 essential fatty acids with Curcupure™ ( certified organic turmeric), Astalife™( astaxanthin) and vitamin D3 in support of healthy cognitive function, a healthy response to inflammation, and for bone, joint, and immune system support. Trusorb™ advanced delivery provides for superior absorption. Guaranteed purity and potency. Natural citrus-mango flavor. This entry was posted in Home and tagged NutraGen, Professional Supplement Center, Pure Digestion Plus™, Pure Greens™ Organic Superfood, Pure Plant Protein, Pure Ωomega Plus, vegan, Vitamins and supplements, www.professionalsupplementcenter.com. Bookmark the permalink.